NEW DELHI: /MUMBAI: The Congress party on Friday expressed concern over the growing political instability in Uttar Pradesh in the wake of dramatic developments in the Samajwadi Party and claimed the BJP is dreaming of “assuming power in the state through the backdoor” by fishing in troubled waters. 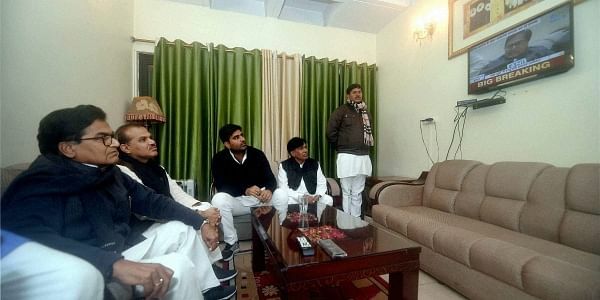 Meanwhile, the Bharatiya Janata Party (BJP) said the people of Uttar Pradesh have already “expelled” Chief Minister Akhilesh Yadav and SP chief Mulayam Singh Yadav should now answer why he “betrayed” the State by imposing his son after the 2012 polls. “Congress doesn’t delve into internal divisions in another party, but we are deeply concerned about growing political instability in UP,” said the party’s chief spokesperson Randeep Surjewala. “Akhilesh Yadav has let down the people of Uttar Pradesh with the all-round failure of his government. He has not fulfilled any promise. People are feeling betrayed. Now Mulayam has expelled him from the party. People have already expelled him due to his governance failures,” said BJP national secretary Shrikant Sharma. People had voted for the SP in 2012 as they were angry with the Mayawati government over poor law and order and development but SP has also let them down, he said, blaming Yadav for “deteriorating law and order”. Meanwhile, the Maharashtra unit of SP expressed complete support to Akhilesh. “Akhileshji has successfully demonstrated how development work can be carried out in a State. Not only the Maharashtra unit of the party, but the whole nation is with him,” State unit president of SP Abu Azmi told Express. “We shall discuss future course of action with Ram Gopalji and act accordingly,” he added.